Lights on and lights out. Staring spells, petits mals, pyknolepsy and absence seizures. The brief spells that occur in patients with epilepsy have riddled neurologists for centuries. This became clear to me when Zaid Afawi and myself saw an epilepsy family in the West Bank on Sunday. When are staring spells epileptic and what kind of seizures are they? For me, this was a good opportunity to read Lennox’s thoughts on this. Eventually, after a long day under the Middle Eastern sun, I fell asleep over the chapter on absence status. The screeching of the needles. No, I didn’t hurt myself and luckily, I was aware enough to put the book away before it could have crashed down on me. Lennox was fascinated by absence seizures, which, after the first application of the EEG, could finally be conceptualized as epileptic seizures. The designation petit mal historically evolved as a distinction to grand mal seizures in the French neurology departments of the 18th and 19th centuries. Therefore, Lennox is quite fond of Tissot’s 1770 description, while he believes that later authors of the 19th century were misled when suggesting that absence seizures might be related to narcolepsy rather than epilepsy. He criticizes Adie for having invented the term pyknolepsy at all. His descriptions of the screeching of the EEG needles during absence seizures almost has a poetic ring to it. Triads over triads. In order to reach your audience in the first half of the 20th century, you needed to come with your own triad. Lennox defines his petit mal triad that contains absence seizures, myoclonic seizures and atonic seizures. While we still use the same concept for absence and myoclonic seizures, the inclusion of atonic seizures sounds a little strange in 2012. We usually think of atonic or astatic seizures in the context of Myoclonic Astatic Epilepsy (Doose Syndrome), which is much less common than epilepsies with absences and myoclonic seizures. However, Lennox is right in pointing out that these three petit mals have something in common. They may occur in a single patient and they have a comparable electrographic signature. Pure epilepsy. Lennox further points out that absence seizures are a very distinct type of seizure that are usually seen in children with normal development. Also, there is little evidence of organic brain damage in these children. This sets classical absence seizures or “pure petit mals” (Lennox) apart from epileptic staring spells in patients with developmental delay or evidence of “organic brain damage”. By pointing out the similarities, but also the differences between pure absence seizures and the complex partial seizures of what he calls psychomotor epilepsy, Lennox pioneers the concept that we still use today. Pure petit mals are short, completely interrupt the stream of consciousness and have a clear beginning and end. Psychomotor seizures and atypical absences, in contrast, may be longer, consciousness may be fluctuating and the start and end may be gradual. And these are the concepts that Zaid and I needed in the West Bank. A family with JME, JAE and ELMA. In the end, after a two-hour session of taking and translating the history, the phenotype in this family was quite clear. We saw a consanguineous family with three sisters affected by various types of generalized epilepsies. The oldest sister had JME with absences, the middle sister Juvenile Absence epilepsy and the youngest sister Jeavon’s syndrome, i.e. Eyelid Myoclonia with Absences. In all siblings, the episodes were brief and the development of the children was otherwise normal. We saved the EEGs up until the end that showed generalized spike-wave in every affected family member. 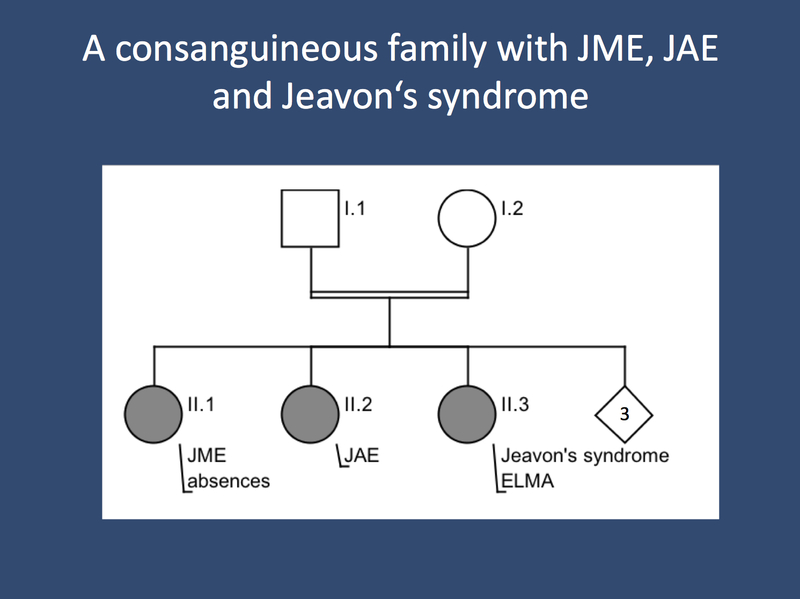 The fact that the phenotypes in this family were crystal-clear to us was largely due to the work of Lennox and colleagues. I can only imagine what kind of discussion this might have caused amongst 19thcentury epileptologists. Pedigree of a Palestinian family with JME and absences, JAE and ELMA. This family raises the question whether we are looking at a recessive disease or a dominant disease with incomplete penetrance. The phenotypes are within the spectrum we would expect for GLUT1 or 16p13.11. This entry was posted in 2012, EuroEPINOMICS, Familial epilepsies, IGE/GGE, Opinion and tagged 16p13.11, absence seizures, Eyelid Myoclonia with absences, familial epilepsy, GLUT1, Jeavon's Syndrome, Juvenile Absence Epilepsy, juvenile myoclonic epilepsy, Lennox, West Bank. Bookmark the permalink.